The tragic events on September 11, 2001 occurred just a couple of weeks prior to the Virginia 10 Miler events that year. The strength of American patriotism shined in the inception of the Running for our Troops Color Guard. 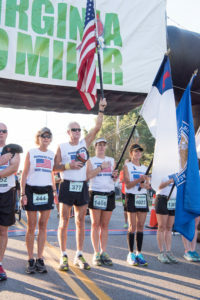 Steve Bozeman, Vietnam veteran, and 8 fellow service members took up their flags and put them on display for all 10 miles of the race that year. The guard has since become an annual tradition and has doubled in size, honoring our troops year after year. Steve Bozeman still leads the guard, carrying the American flag, to this day. The guard stays as a team, running the full course together, a great symbol of unity in support of our military.